The Gold Wing motorcycle has been the gold standard for two-passenger, long-distance trips for nearly 30 years, and the 2013 Honda Gold Wing Audio Comfort will continue that legacy. The latest electronics create user-friendly navigation and audio systems that make costal and countryside travels even more luxurious than before. The smooth, 118-horsepower engine combined with sporty handling makes for an enjoyable ride for both driver and passenger. A new, built-in MP3/iPod interface plays your favorite tunes through an SRS CS Auto surround-sound system, while the navigational system guides you to your destination. Additionally, an improved GPS receiver snags satellite signals to accurately guide the rider through the proper lanes as they approach junctions. Sleek body work, superior wind protection, and a smooth suspension will keep you comfortable, but you won’t have to sacrifice storage space, as significant luggage capacity will hold all of your belongings while keeping them safe from the weather. 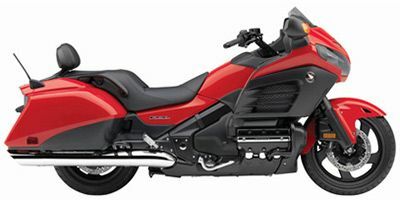 Also new for the 2013 Gold Wing Audio Comfort is the option of Grey Metallic and Light Silver Metallic paint jobs, which join Ultra Blue Metallic and Candy Red. While the Honda Gold Wing Audio Comfort is the base model, three upgrade levels are available starting with the Gold Wing Audio Comfort Navi XM, which incorporates a satellite-linked navigation system and XM Radio, Weather, and Traffic. The next model in line is the Navi XM ABS, which adds combine anti-lock brakes to the previous upgrade. The last model in line is the 2013 Gold Wing Airbag, which includes the previous upgrades and a First Motorcycle Airbag. This entry was posted in Uncategorized and tagged Deluxe, F6B, goldwing, Honda. Bookmark the permalink.